In Gutenberg–Richter (GR) earthquake frequency magnitude relationship the b-value plays an important role and is required for the seismic hazard analysis of any region. In this study, both the Gumbel’s extreme distribution and the GR methods are used to estimate the b-value for Sylhet region of Bangladesh. Due to the geological location this region is the most seismically vulnerable area of the country. Sylhet region is situated on the south eastern part of the Dauki fault. The frequency of seismic activity at the Dauki fault zone has lessened after the great Indian earthquake that occurred in 1897. Therefore, energy may be stored in this fault region, which leaves possibilities that Sylhet may encounter an earthquake. The Sylhet region has experienced nearly 184 earthquakes of magnitude ranging from 4 to 7.2 during the last 101 years. In this study, the probability of recurrence of earthquakes of various magnitude has also been investigated using USGS catalogue which has been prepared by taking moment magnitude (Mw) as a homogenous magnitude. 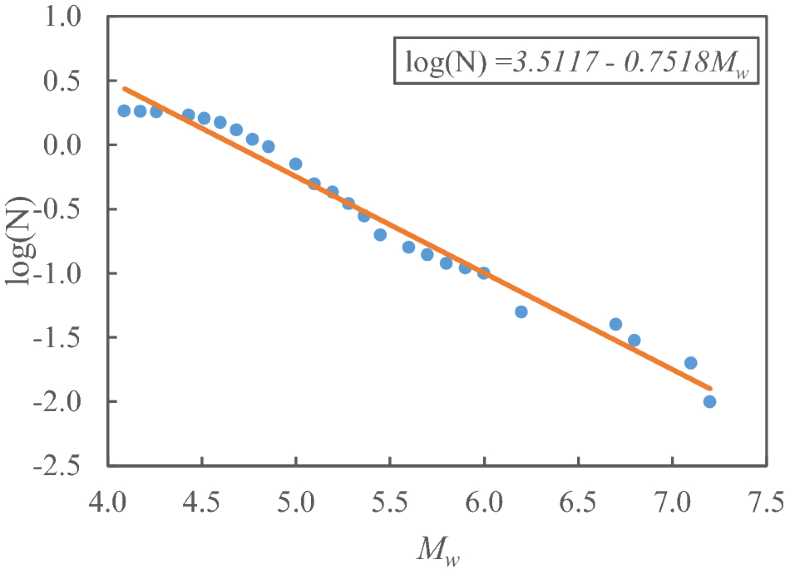 The least square regression method has been applied to compute the b-value by the GR relationship, which resulted in the b-value to be 0.75. Nevertheless, the regression analysis through Gumbel’s extreme value displays a satisfactory result. Further the regression analysis through Gumbel’s method estimated the b-value to be 0.91 and using this the earthquake recurrence probability and the return period for different magnitudes have been calculated. From the probabilistic analysis it has been found that the probability of recurrence of an earthquake (R) of Mw ≥ 6.5 in 100 years is 85% and its return period (Tr) is 53 years in this region. The earthquake recurrence probability of significant damaging earthquakes affecting Sylhet and their return periods have also been investigated. It has been observed that the probability of recurrence of an earthquake equal or greater than 1885 Bengal earthquake (Mw ≥ 7.0) in 100 years is 48.5% in this region and its return period (Tr) is 151 years. The probable level of ground shaking and the recurrence of the earthquakes are defined as seismic hazard , though it is impossible to precisely estimate the occurrence of earthquake time. However, in order to minimize the economic consequences of an earthquake it is essential to assess the seismic hazard. Estimating the probability and return period of an earthquake based on previous information may be one of the most significant parts of the hazard reduction program. The prediction method of an earthquake can be either the statistical prediction based on previous events or the deterministic prediction based on the earthquake signatures . The Guttenberg–Richter relationship is a statistical prediction method which plays an important part to understand the earthquake probability and the return period. Gutenberg and Richter  proposed the mostly known empirical relationship between earthquake magnitude (M) and frequency of earthquakes (N) that is applied extensively to predict earthquakes and finding out the rate of exceedance of an event. 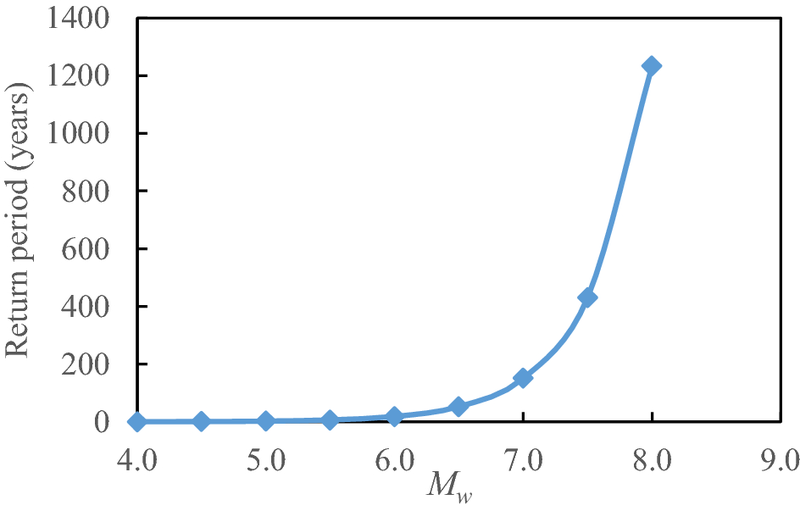 Here a and b are the constant parameters where the value of a denotes the seismicity level in an area where b is the slope of magnitude frequency curve. This is a well-recognized equation which is implied to predict the earthquake occurrence. Several researchers demonstrate that the b-value is normally close to 1 and the global average value of b-value is generally taken as 1 [4, 5, 6, 7, 8, 9, 10]. The b-value plays an important role in GR relationship. As it helps to structure a clear idea about the seismic pattern and the seismic stress level of an area [4, 11], the calculation of b-value is a fundamental step for the seismic hazard analysis of any zone [4, 12, 13]. 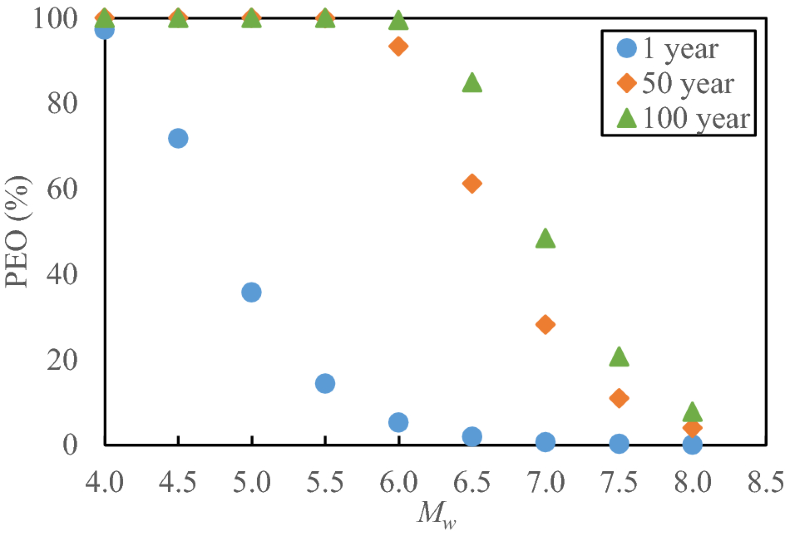 In this study, two statistical methods, Guttenberg and Richter frequency magnitude relationship  and Gumbel’s extreme value method , have been used to compute the b-value. Ahmed et al. reported that the GR method delivers better output in terms of the presence of numerous earthquake events ranging from low to moderate magnitude. On the contrary, when the magnitude is low, the b-value gets deviated from its constant value of 1 [4, 5, 15]. In a tectonically active region, the b-value is usually close to 1 [16, 17, 18]. In this study, regression analysis through GR relation yields the b-value of 0.75, which indicates inadequate seismic events [4, 8]. Therefore, this study has been conducted by using Gumbel’s extreme value method  on the calculation of b value for Sylhet region where large earthquake events have been available. The reason behind this implication is the exploitation of the maximum magnitude of each year, resulting in a reduction of uncertainty due to lack of historic data [4, 19, 20]. The main objective of this study is to estimate the earthquake recurrence probability and return period from the better b-value obtained for Sylhet region. 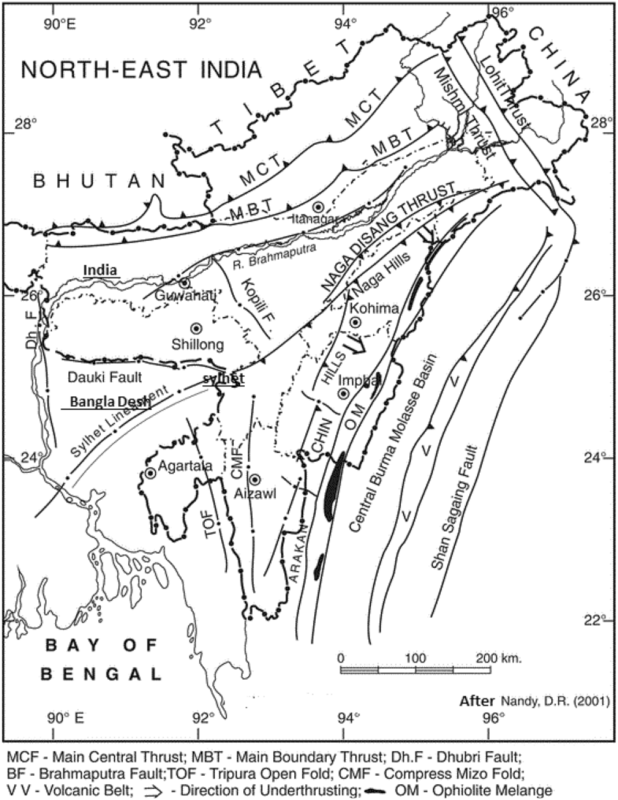 Bangladesh is critically vulnerable to earthquakes for its geological position as it forms the northeast part of active Indian subcontinent [21, 22]. The Indian plate collides with the Eurasian plate and underthrusts the Myanmar plate as well. These events symbolize the tectonic framework of this region [23, 24]. For the past 40 million years the Indian part subcontinent has been pushing northward against the Eurasian plate at an estimated rate of 5 cm/year, giving rise to the severe earthquakes and most diverse landforms known [25, 26]. The existence of Dauki fault system of eastern part of the Sylhet zone, and the highly disturbed southeastern Assam region with the Haflong fault, Naga thrust, and Disang thrust endangers the Sylhet region with a risky seismic coefficient of 0.08 . Sylhet City has a high potential for damaging earthquake resulting in losses with a huge population to a large percentage of structures that have not been designed to resist earthquake forces . The Sylhet Trough is a tectonically complex province of tectonically active northeast Indian subcontinent. The transition between this Sylhet Trough and the Shillong Plateau is represented by the Dauki fault system with huge vertical displacements . Figure 1 shows the position of Dauki fault with surrounding tectonic details. Morino et al. [30, 31, 32] first identified the active Dauki fault in the trench at Gabrakhari village, where their study displayed the rupture of Dauki fault commencing in AD 1548. The historical seismic event of AD 1500–1630 occurred in this Gabrakhari trench site, on the western part of the Dauki fault. This event is consistent with the 1548 earthquake which is the most recognized first large earthquake felt in Bangladesh [22, 31, 33]. It is believed that the Shillong plateau has a thrust plane underneath it and is enduring a southward thrusting, which disproves the concept of vertical tectonism along the Dauki fault, with a notably high seismic status . All these past events, and geological analysis conclude that the Sylhet region is higher in seismic vulnerability compared to other regions of the country, and thus makes itself an ideal place for studies and researches on seismic hazards. 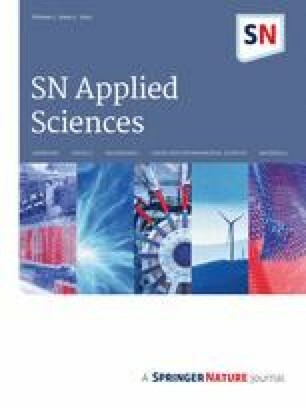 The analysis of observed extremes and forecast of future extremities for any phenomena has been conducted through the implication of the statistical theory of extreme values . In the earthquake engineering research works, this theory has been applied effectively by many researchers in the past few decades [20, 35, 36, 37] in various regions of the world. Siddique  analyzed the seismicity in Bangladesh through the Guttenberg-Richter law. Though a few research works, for instance, loss estimation due to earthquakes , vulnerability assessment of buildings due to earthquakes [21, 39, 40] were conducted on Sylhet city, but no significant research works have been carried out to calculate the variation of b-value and estimate the probability of recurrence and return period of earthquakes for the Sylhet region. Bangladesh has no record of historical earthquake data of its own. Though one analog seismograph was installed in 1954 in Chittagong but no data is available in the public domain . There are thirty-four strong motion accelerographs (SMA) installed in the different location of Bangladesh in 2006 but these accelerometers cannot record small earthquakes. To make an effective decision, a complete earthquake dataset of both big and small earthquakes is necessary . Here, the study has been carried out using the earthquake catalogue from USGS . To obtain a better result for the period of 1918–2018 (up to April 2018) for Mw ≥ 3, a total number of 184 events recorded in USGS catalogue within the area about 370 km of Sylhet region have been used in this study. In their research, Ahmed et al. considered the study zone with a distance range of 300 km. Conferring to their statement, this range is largely suitable for examining seismic hazards, though the occurrence of events is less in number. The authors  further stated that the damaging impact of the earthquakes beyond this range are not significant, because the medium and distance diverges from the source to site, even if the magnitude is large. Geographically the study area is circumscribed by latitude 24 N–26 N and longitude 91E–94E covering a total area of 137,558 km2. In order to understand the pattern of earthquake occurrence, a seismicity map of Sylhet region has been prepared as shown in Fig. 2.
where Mb= body magnitude, Mw = moment magnitude. The validity of Scordilis relation is limited to magnitudes ranging from 3.5 to 6.2, which can also be identified in Fig. 3. The magnitude conversion process began with all the moment magnitudes (Mw) being plotted as same as it was in the catalogue, putting a high priority on them (Mw). Next, the body magnitudes (Mb) were converted into the moment magnitudes (Mw) as well. However, surface magnitude conversion was not done because of the unavailability of sufficient data. Two approaches, Guttenberg and Richter frequency magnitude relationship and Gumbel’s annual extreme values method were used, to compute the b-value for Sylhet region. GR relation Eq. (1) is implied to obtain the value of coefficient a and b, which establishes the following GR relationship. 184 seismic events were used in this case and an estimated b-value of 0.75 was obtained. Though the value found from the study appears to be satisfactory but genereally, the b-value of 1 is more expected when the study area is a highly seismically active zone like Sylhet with numerous occurrences of events . Furthermore, as the foreshocks and aftershocks were excluded, it eventually decreased the value of b . According to Ahmed et al. the value of b may increase if the foreshocks and aftershocks are included in the calculation, increasing the amount of seismic events, it is safe to choose the main events only to lessen the uncertainty. 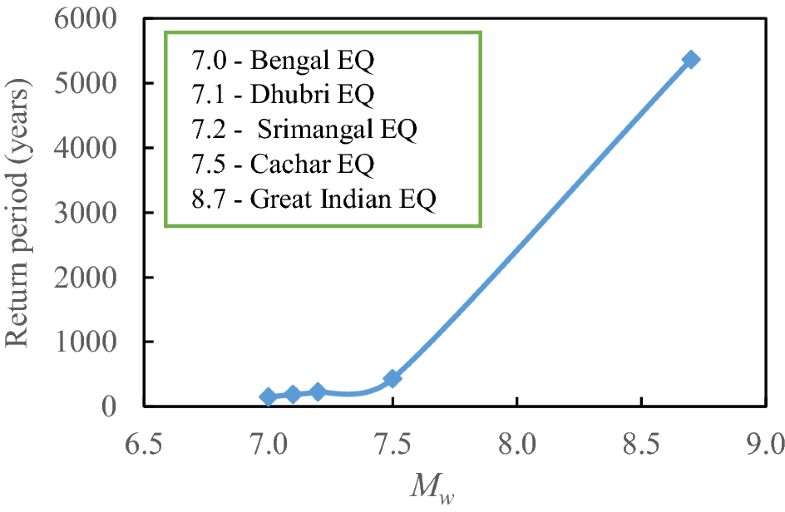 The earthquake frequency-magnitude relationship for Sylhet region is shown in Fig. 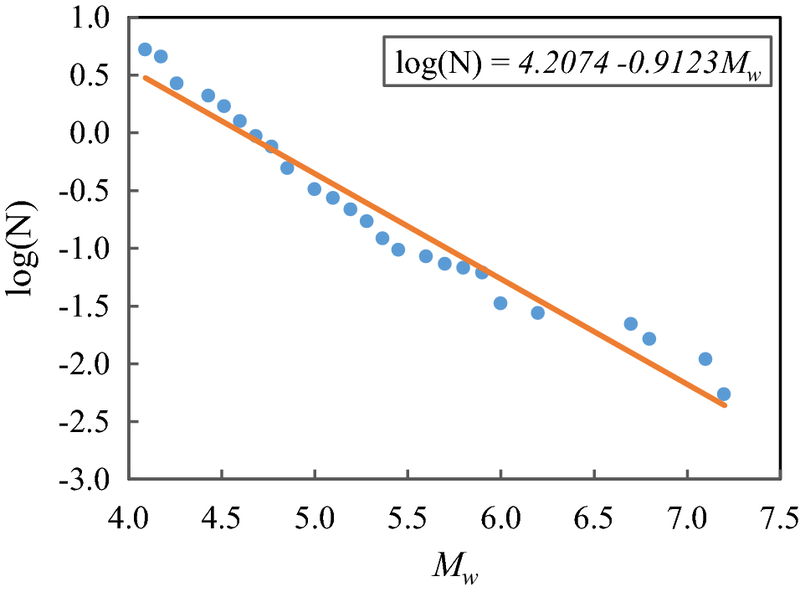 4.
where α and β are regression coefficient and M is the magnitude of the earthquake. Table 1 shows the regression constants obtained through the selection of maximum earthquakes of the year 1918–2018. At the end, the least square method is used to calculate the values of a and b, implying Eqs. (5) and (6). The values are plotted in Fig. 5. The values of a and b are 4.20 and 0.91 respectively, whereas Gumbel’s regressions coefficients are estimated as α = 16,121.3 and β = 2.10 by using these values of a and b. The probability of recurrence of the earthquake of magnitude M or risk for 1 year (R1) and for D years (RD) and the return period (Tr) have been calculated using the following formulas [20, 37, 46]. The estimation of the recurrence probability and the return period is computed for Mw = 4 to 8. Table 2 shows the earthquake occurrence probabilities calculated for periods of T = 1, 50, 100 years and for a magnitude range of Mw = 4.0 –8.0. From the study, it has been found that the probability of recurrence (R) of an earthquake of Mw ≥ 6.5 and Mw ≥ 7 in 100 years is 85% and 48.5% respectively and their return period (Tr) is 52 years and 151 years respectively. Figures 6 and 7 shows the cross-plots of the magnitude and the recurrence probability and return period of each earthquake, respectively. 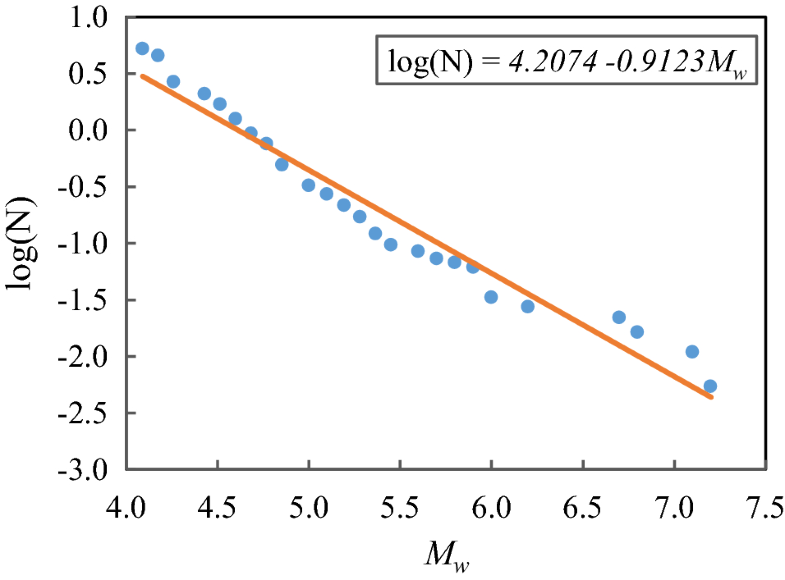 The study reveals an inverse relationship between magnitude and return period. 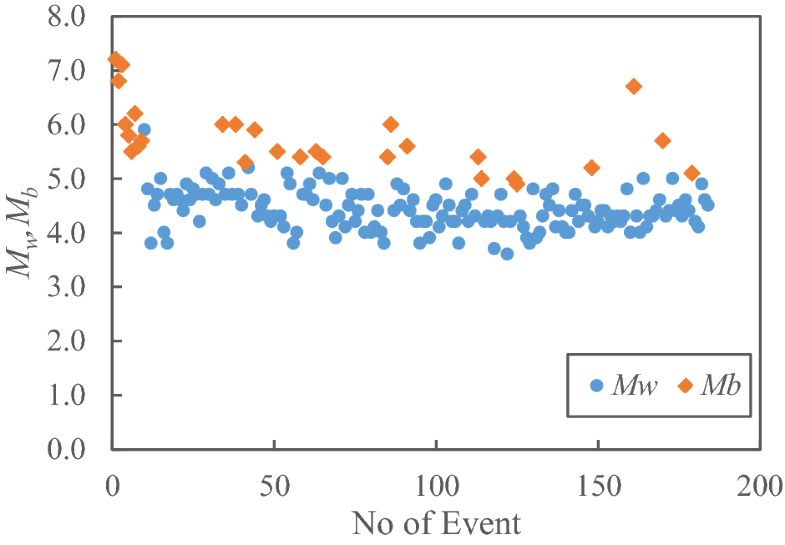 A similar relationship has been observed between the magnitude and recurrence probability of an event. The Sylhet region has been severely affected by a number of prominent historical earthquakes. The significant damaging earthquakes that have affected Sylhet since the middle of the last century are presented in Table 3 [25, 34, 42]. The probabilities of earthquake recurrence of these damaging earthquakes are calculated for periods of T = 1, 50 and 100 years are presented in Table 4. From the study it has been found that the probability of recurrence (R) of an earthquake equal or greater than 1885 Bengal earthquake in 100 years is 48.5% and its return period (Tr) is 151 years. 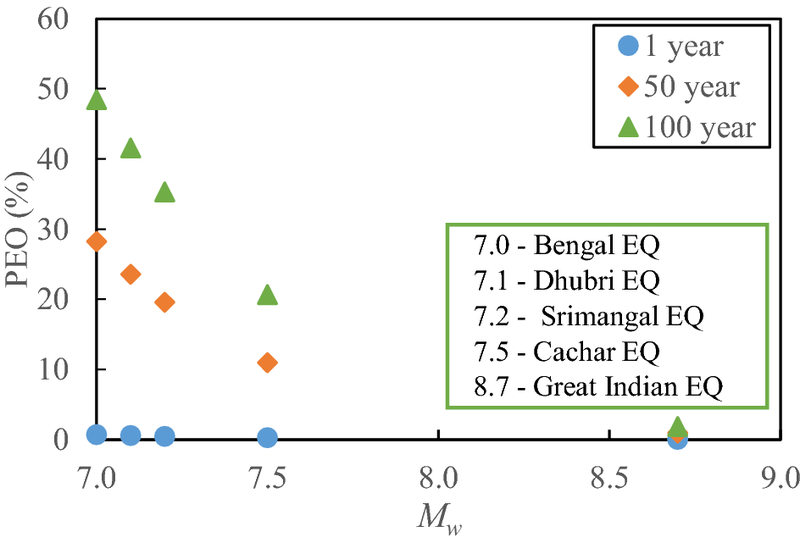 The probability of recurrence of Dhubri, Srimangal and Cachar earthquakes in 100 years varies in the range of 20.70–41.6% with a return period of 186–431 years. The magnitude and recurrence probability of these damaging earthquakes and their return period are cross plotted in Figs. 8 and 9 respectively. In a study, Alam et al. found out that most of the buildings of Sylhet city are non-engineered, poorly designed and are of poor quality. Islam et al. demonstrated that an earthquake with Mw ≥ 7 will result in major human causality and economic loss due to the collapse of a large number of buildings in major cities of Bangladesh. In another study, Ansary et al. 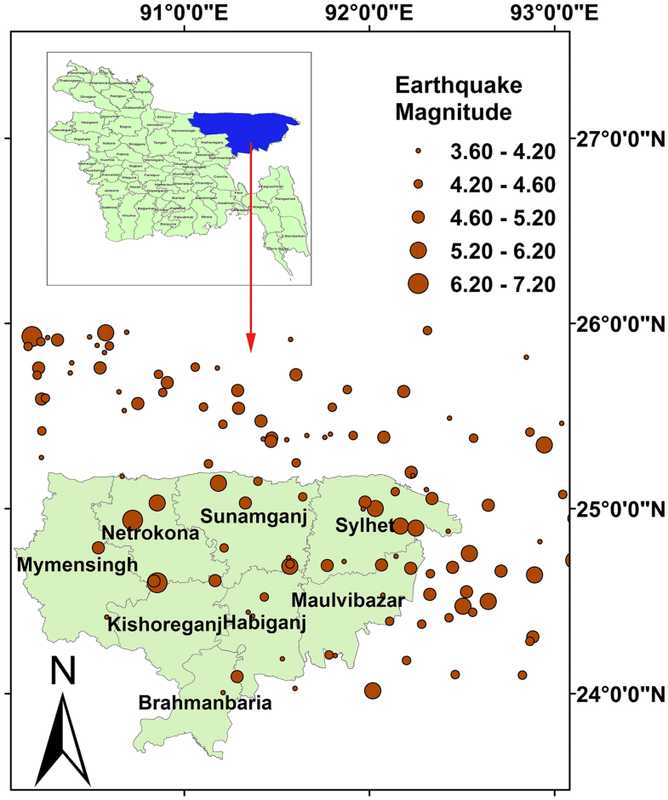 identified probable damage of 59% of buildings and 7% fatalities at night in Sylhet city from an event similar to the 1918 Srimangal earthquake. Therefore, considering regional seismicity, seismic history and seismic risk for Sylhet region, proper measures need to be taken and buildings should be designed and constructed in this area following building codes to safeguard properties and life. In this research, both Gumbel’s annual extreme value method and GR relationship have been applied to analyze the consequence of the catalogue on the b-value of Sylhet region. The estimated b-value based on GR relationship is 0.75 which may be considered suitable, but this study aimed to find out more appropriate b-value for this region. The b-value is very much dependent on the seismo-tectonic setting of a seismically active zone or region. In a seismically highly active zone, the b-value is normally close to 1.0 [16, 18, 47]. Therefore, in accordance to the seismo-tectonic settings of the study area, the b-value of 0.91 calculated based on Gumbel’s distribution was found to be more relevant and hence this value has been implied in this study to obtain the return period and probability of recurrence of earthquakes. The probability of occurrence, according to Gumbel’s statistical analysis, of an earthquake for magnitudes 6.5, 7.0, 7.5 and 8.0 tends to be 85%, 48.5%, 20.7%, and 7.8% respectively in 100 years. The return periods of the mentioned are 52.79, 150.90, 431.37 and 1233.11 years respectively. The return periods of significant damaging earthquakes with recurrence probability have also been identified in this study.